A new crew survivability concept that would build military vehicles around a protected personnel compartment and use a sacrificial “blast wedge” to absorb energy from improvised explosive devices could improve safety for the occupants of future light armored patrol vehicles. Researchers from the Georgia Tech Research Institute (GTRI) have designed and tested the concept, dubbed ULTRA II, for the U.S. Office of Naval Research (ONR). The crew-protection concept builds on an earlier GTRI development for the ONR that evaluated new concepts for light armored vehicles. A blast test conducted with the ULTRA II full-sized crew compartment test article at the Aberdeen Test Center showed that the new concept could protect the vehicle crew from improvised explosions. The ULTRA II crew compartment was designed to house six persons: a driver and commander facing forward, and two pairs of crew members behind them, each pair facing opposite sides of the vehicle. By putting their backs toward the center of the crew compartment, the concept moves the crew away from the outside walls to reduce the likelihood of injury from side blasts, provides better visibility for the crew to monitor their surroundings, allows blast-resistant seats to be frame-mounted—and facilitates faster egress from the vehicle. 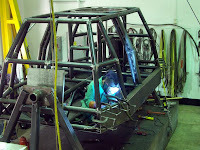 The crew compartment envisioned by GTRI uses a “space frame” constructed of tubular steel—similar to civilian off-road racing vehicles. An armored steel “skin” provides added structure and moderate ballistic and blast protection. Additional armor is bolted onto the frame in a modular way, allowing varying levels of protection that could be easily modified in the field and changed as new high-performance armor concepts are developed. An integral part of the protection is provided by a sacrificial “blast wedge” bolted onto the bottom of the vehicle. Constructed of welded steel armor, the wedge both deflects energy away from the vehicle and absorbs energy from a blast, performing a function similar to “crumple zones” in modern civilian vehicles. The design and fabrication of the test article was conducted by personnel in the Aerospace, Transportation and Advanced Systems Laboratory of GTRI. Tests using a heavily-instrumented test article with instrumented dummies simulating the crew showed that the wedge deflected or absorbed nearly 70 percent of the energy from an explosion beneath it. Damage from the blast was primarily confined to the sacrificial blast wedge and there was no structural damage and no blast penetration to the crew compartment. Because the wedge is removable, it could be replaced if damaged. Making the blast wedge removable also allows for an overall reduction of the vehicle’s height for shipping, an important issue for rapid deployment. The research team, which also included Burt Jennings, Cal Jameson, Jake Leverett and Mark Entrekin, combined non-linear dynamic blast simulations and neural networks to study how blast forces would affect the vehicle. Conventional finite element analysis also provided valuable design feedback in development of the ULTRA II test article. There were many tradeoffs to consider in designing the new concept, including vehicle height and resistance to blast forces that may come from many different angles. In addition to crew protection, the researchers also designed a translating door that would provide a large side opening similar to that of existing civilian minivans. Such a door system would provide improved ingress/egress for the crew and could remain open when the vehicle is moving. GTRI has presented data from the test to the Office of Naval Research, and hopes to pursue additional refinements to the blast wedge and overall vehicle concept. Among the goals would be to improve energy absorption from the blast wedge, and to evaluate whether the crew compartment should separate from the drive train in certain types of blasts.